It’s hard to remember exactly what it felt like to look around my home and decide what to take. It was the third threat we’d had in a few weeks — was it real? Would we be back the next day? Days later, I heard a radio jockey comment on how disgusted he was by the people he saw on TV getting onto buses, not carrying “so much as a bottle of water.” It was the rant, I thought, of a clueless, spineless, bully. If you don’t believe me, give yourself an hour and mentally pack everything in your life that you think you would want to save if you knew for sure your home was about to be decimated. Then mentally fit it in your car. Don’t forget all the people who have to fit in there — and the pets — and the important documents — and the family pictures — and the heirlooms — and the bags of ice — and food for the trip — oh, and I guess you need everyday niceties like clothes and underwear and toothpaste and a hair dryer. Don’t want to take up valuable room with shoes? Okay, but you’ll be wearing those flip-flops for the next six weeks. So you take what wins the coin toss of the moment — and you probably rationalize that you’ll be back tomorrow anyhow — and you say good-bye to your life and you drive away. For the next little while, you’re on vacation and you’re watching this crazy story on television that you can sort of relate to, but not really… and you’re texting your friends with one hand and emailing and talking on the cell phone with the other… and screaming at the TV to go just an inch to the left so you can see your house! AAARRRGGGHHH!!!! Our honeymoon with this adventure is over, isn’t it? Life on the run feels a little more like life in exile this week than last, and as more of us get in to see our properties, we’re finding that even those that looked the best in the pictures often have some pesky problem – like mold or a boat in the living room. I was feeling that way when I learned yesterday that my building won’t be livable for “at least” a month, and my Isla del Sol house took on some water. In both cases, the adjuster is on the way and I’m sure it will eventually be fine, but what a pain, right? Last night I had dinner with my wonderful friend, Glen, who after years as head of the Ag Ed department at Texas A&M has taken on the daunting – and I do mean daunting – task of teaching the Iraquis how to become agriculturally self-sufficient. After hearing my tale of Life on Lake Woe-is-Me, he told me – in his inimitably patient, kind, non-judgmental way – that a number of the people in Iraq – roughly the same number of people who live in the State of Texas – have been without power, water, sewer for five years. This entry was posted on October 20, 2008, 4:05 pm and is filed under The Storm. You can follow any responses to this entry through RSS 2.0. You can leave a response, or trackback from your own site. Love your style of writing. What an eye-opening comparison between Iraq and Galveston on literally being powerless – especially when describing the relatively “short” timeframe in Galveston as “messy, inconvenient, life-altering, but doable.” You certainly have a gift for viewing life in realistic terms. Thanks for sharing, Alice. I have been reading the emails you sent and had to send a shout out to you. What a gifted writer you are! 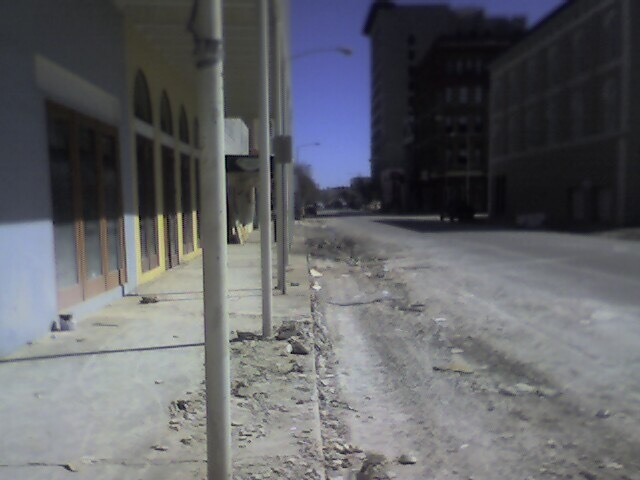 I found the comparison between Baghdad and Galveston especially poignant. I had dinner this evening with Marcia Wallace who had been the speaket at the Nancy Owens Memorial Foundation luncheon earlier today. She mentioned the 200,000 Iraqis that have died. It staggers the mind. We seem to forget that. I keep wondering about the missing people from Galveston — and wonder if we will we ever know the number of victims of Ike. Thank you for your updates, your philosophy and your keen outlook on life. I am honored to be in business with you. Thank you for reminding us of the suffering of the Iraqis. We have family in Siberia – when my mother-in-law sets cooked potatoes on the balcony to cool they are stolen – from the second floor – because so many people are hungry. A few years ago hundreds of thousands of people in my husband’s native city of Omsk had no heat for months in the middle of the 40 below Siberian winter. People would pay their bills, but the gas company refused to turn on service in huge tenement blocks of the city. When you go through something as devastating as Hurricane Ike it connects you in a new way to others who have been through similar (or worse) ordeals. It’s the gift of our difficulties. We don’t usually feel it until after the worst has past. Alice, you are a wonderful writer able to capture and communicate what a loss of this magnitude feels like! In 2007 I visited my home in New Orleans where I once lived as a child. All that was left was a set of cracked concrete steps. As I stood there I was suddenly overcome by the feeling that part of my life had been excised. I can only imagine what it’s like to see your current home destroyed. Thank you. I once heard that if you were to sit in a circle with all the people of the world, everyone throwing their troubles into the middle, and were able to choose a set of troubles to take… you would eventually just pick your own back out. It’s amazing what you can go through and look back and say, “oh yeah, that happened”. Your strength and bravery are venerable and your documentation is fantastic.